There we found a old rhino bull lying on its side with both horns maliciously removed. 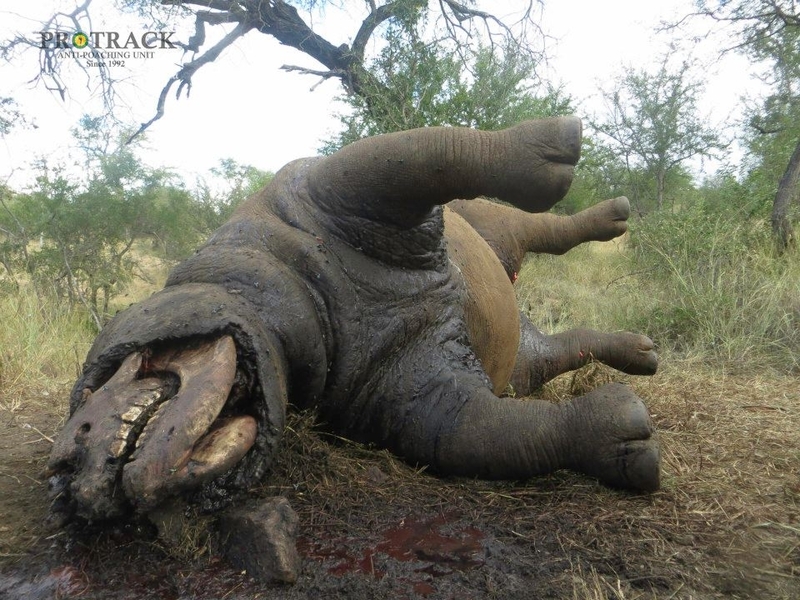 By the looks of things the rhino had been shot on the right hand side of its head, with the bullet entering at a downward angle. on further inspection of the scene we found a two open wounds on the rhino’s back, the wounds seem to have been cause by a axe. The reason for this could have been to hack through the animals spinal column, sever through its central nervous system rendering the animal immobile. Once the crime scene investigating authorities had taking all the information that they needed such as photographs, tracking of spoor and looking for a cartridge. Vincent Barkas and I were left to begin the Autopsy on the animal. We used the metal detector to find out if there was a projectile inside the animal or not. On the first attempt with the metal detector we received a strong signal around the animals head. After a few minutes of searching we found the projectile. We then determined that it was was a large projectile, which means that a hunting rifle with that calibre was used to shoot the animal. The projectile was handed over to the SAPS and the investigation was complete. The savage killing of our rhino’s in South africa continues and the total for the year is working its way up to the 300 mark!! !